You're probably wondering what Pralinutta is.. well ladies and gentleman, it is pretty much a cheaper version of Nutella or at least is was at my grocery store. 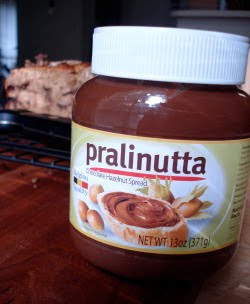 As I browsed the peanut butter isle during my last trip I got a craving for Nutella, but as I went to pick up a jar I noticed the Pralinutta (about $2 cheaper) I felt inclined to give it a try. Once it made it into the cupboard it was time to brainstorm.. what kind of baked good did this delicious little jar want be a part of? 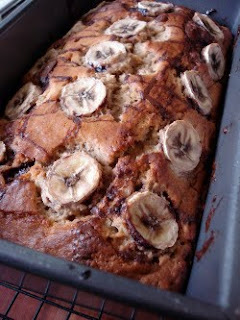 It came to me at the gym (surprisingly that is where I do a lot of my recipe thinking).... banana bread. Especially perfect due to the 3 bananas waiting patiently in my freezer. Preheat oven to 350. Spray a loaf pan with cooking spray and set aside. In a bowl, whisk flours, baking powder, baking soda and salt. In a large bowl cream butter, sugar and vanilla. Beat in egg, add bananas and mix until incorporated. Stir flour mixture into wet mixture. Slowly mix in milk. Place Pralinutta in a small bowl and microwave for about 15 seconds (making it easier to pour). 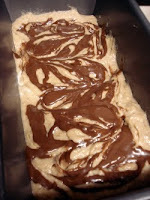 Pour 1/3 of batter into loaf pan. Drizzle portion of Pralinutta over batter and drag knife through to get the swirl effect. Cover with another layer of batter and Pralinutta and repeat. (You'll do the layering a total of 3 times). 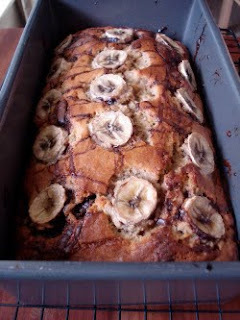 Optional: If you have extra bananas laying around place slices on top before going to the oven. Transfer to oven and bake for 50-60 minutes. 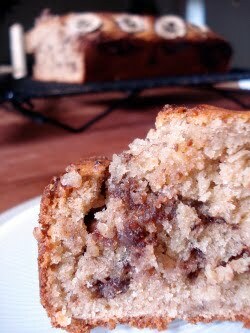 Allow to cool for at least 15 minutes on cooling rack before diggin' in.